Cut the green tops off of the leeks. Then slice the stalks lengthwise through the center. With the roots still attached wash the centers to remove any grit. Now cut off and discard the roots, then roughly chop the cleaned stocks. Add the chopped leeks, cauliflower and remaining ingredients to a large dutch oven or soup pot. Place over medium-high heat and bring to a simmer. Lower the heat, cover and simmer for 20-25 minutes, or until the cauliflower has softened. 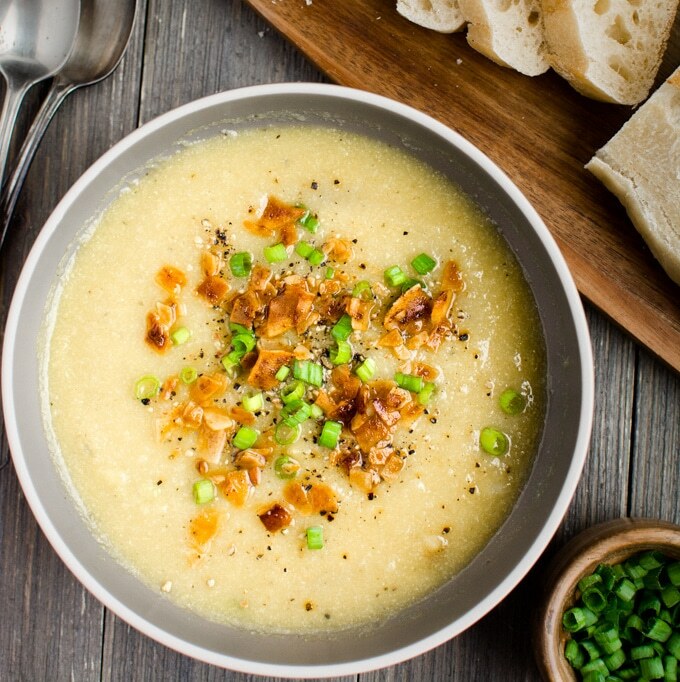 Once the cauliflower is soft, use an immersion blender to blend the soup until it is smooth and creamy. You can also transfer the soup to a regular blender and blend it in batches.